If you have been feeling a sense of change in the restaurant space in the past few years, then you’re not alone. There is an underground shift occurring right before our eyes, though we may not be noticing this massive change affecting the status quo, it appears to have reached a fever pitch in both operator and consumer food awareness. The undetected shift is one that could rock the industry for years to come. How does a status quo shift begin? Well, the groundwork and building blocks are the basis of any movement. First, you have to convince a few influencers to make a change in something they are doing and the more passionate they are, the better. Then, it takes some time to actually gain traction and begin the effect on the industry that a change is about to hit. Once the long tail hockey stick goes into full swing, the movement is unstoppable. I had a chance to be part of one of the biggest movements in foodservice when I started fastcasual.com in the mid-1990s. It was a challenge to get the fast casual brand leaders of that era to think of themselves as innovators, and the QSR brand leaders to change their model of food before it was too late. These new innovators in fast casual were the people who would shift an entire $700 billion market in the following two decades— they just didn’t know it yet. That was in 1996. 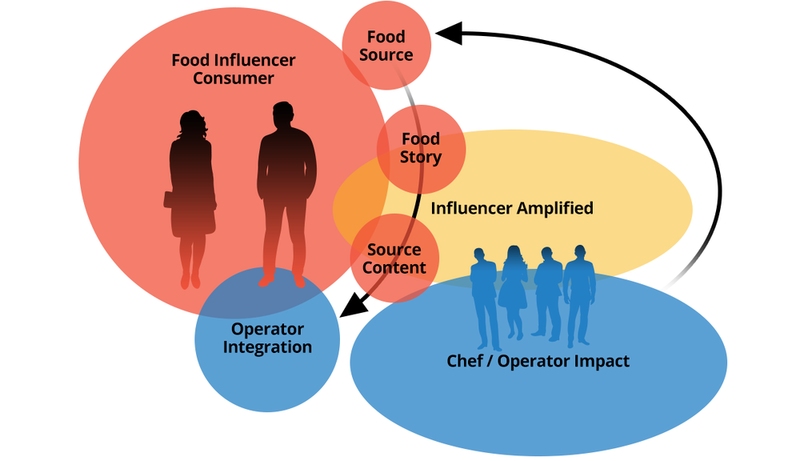 Now, social media has changed the entire landscape of food, with trends and insights being identified much faster from the chef and operator influencers or even pushed by their customers to move into a new way of doing things. That is what is happening right now in the local sourcing business. We have seen a major shift of consumers that are recognizing a new level of quality of food and then are demanding this from the rest of the foodservice ecosystem in which they engage. Chefs, operators, bartenders, the wait staff and kitchen crew are all being grilled about sourcing, freshness, and creativity by the modern consumer. This phenomenon is referred to as the “pull-through model,” where demand for products require businesses to adjust the very way they do business based on the consumer demand shift that is occuring. This is no longer a dream for local sourcing suppliers, it’s a reality and it’s being led by a new generation of consumers. It boils down to not only the consumers shifting their idea of what great food is, but them imposing their will on the industry itself. We have tracked over 1800 protein suppliers in the U.S and mapped them against operators and consumers that are pushing for new sourcing models to be developed. What this means is that the operators are changing the way they obtain their high-quality proteins, marry this with the massive change in sustainable farming, ranching, as well as, new age farmers (urban), and you have the perfect storm occurring. Ten years ago, this ecosystem did not exist. The proliferation of web technology, DIY e-commerce, social media and content marketing has completely changed the story model of how these companies now go to market. Our analysis of these protein suppliers revealed some interesting elements that were happening at the national level versus the local level and are beginning to cause real change in the protein supply chain. The local level leads the way with innovation on digital engagement tools that not only reach the operator, but also feed the operator’s own guest community, too. This, again, is a “pull-through strategy” that is clearly working when we score the top protein sourcing companies in relation to operator sentiment and consumer sentiment along with engagement on overall conversations on social media about the protein suppliers. These new breed of suppliers are creating and circle of conversation we have never seen in the foodservice business before. The engagement tools and tactics are really the secret to the success of these suppliers, and in some cases its not actually the supplier, but the consumer that energizes the engagement with something as simple as an instagram or twitter post and photo. Once the consumers get wise to the source, the social impact begins. By analyzing video, social, and e-commerce as a digital footprint, we can begin to see the areas where the local sourcing groups are pulling ahead at warp speed. Getting to the next level in story telling should be the mission of every supplier in the game. Understanding how to reach the food enthusiast and impact the restaurant operator will be the strategies that will win in the future. Visits to upscale casual dining spots are climbing thanks to millennials who have increased their dining occasions a total of 24.7 percent. On the other hand, dollars spent at traditional casual properties are down because that same demographic has reduced its visits to those establishments 39.9 percent. Is it the service? The Edison lights? Or is the shift rooted in the menu? Diners are always dialing into their preferences. This has never been truer than how money is spent on protein options. Gone —for now —are the days of the big slab o’ beef and baked potato. Diversity, provocative flavors, and vegan factors are forces with which to reckon. Pork has increased 23.99% in mentions by food influencers in comparison to October 2015. You will struggle to find straight-up, cut muscle preparations on center-of-the-plate pork dishes. So why is pork consumption up? Bacon is king, pulled pork is hipster paradise and pork belly still has traction. Landing in the top spot for overall consumer sentiment, today’s pork is different, at least in menu construct. Partly fueled by barbecue restaurants’ emergence, counting on pork as a staple, and bacon going on, well, everything. Pork is easy to find, a cost-stable commodity, and well-suited to tag with the nomenclature of local, heritage breed and humanely raised, that makes marketing easier. Take Atlanta’s much-lauded Miller’s Union; no fewer than three pork dishes on their dinner menu, including a very approachable braised pork shoulder and a pork belly appetizer. Chicken is back. Sort of. Down, but not out. Chicken has decreased 2.1% in mentions by food influencers in comparison to October 2015. Chicken is down a bit in mention by the food movers and shakers. However, this very urbane meat choice still sits at a comfortable number two spot with consumers. More exotic preparation of wings, like the black garlic treatment at Philly’s riotously popular Cheu Noodle Bar, are getting attention. Pushing beyond ordinary is a theme for chicken. Fried chicken preparations are the perfect lean towards the nostalgia that pervades contemporary menus. Juicing the dish with Nashville/Memphis-style hot chicken has heated the velocity. Add the spread of fast-casual Peruvian chicken shops, and chicken is taking flight. While losing market share to other proteins, chicken will remain a canvas for creativity. Also in Philly, Love & Honey creates the buzz around their singular focus on their artfully fried chicken. Big doses of flavor, unique preparations and excitement are the prescriptions for keeping chicken Instagrammable and noteworthy. Without intentional nods to creativity, tired, old chicken dishes will be relegated to oblivion. The provenance of the chicken matters. Growing in popularity is antibiotic-free, quality birds that make for quality ingredients. Love & Honey rides that wave with intentional use of consciously-sourced birds, making for social media-worthy posts, an allure to the groups that care and spend money on this marketing advantage. Seafood has increased 24.7% in mentions by food influencers in comparison to October 2015, showing the most improvement out of all proteins measured. Seafood has long been verboten at home. Knowing how to prepare shellfish and finfish alludes many home cooks. Seafood has long been treated as an entire category that is reserved for being eaten out of the home, for special occasions or for the diet aware. Now, all three elements combine for nabbing the most mentions from a year prior. Shrimp has become more casual. Lobster rolls are everywhere. Salmon is getting slapped onto salads as an add-on. Raw oysters are snacking favorites. Seared tuna and poke are becoming routine. And Fish tacos rule the world. No question, seafood is restaurant gold. Lamb has decreased slightly, down by 9.5% in mentions by food influencers in comparison to October 2015. James Beard Award winner, Philly’s Michael Solomonov is unapologetically moving Israeli food out front. With a win for the very Israeli Zahav book, it is the use of lamb in Israeli cooking that is helping to push this oft-dismissed red meat to the foreground. Lamb sits at a comfortable fourth spot in customers’ protein preference. Further burgeoning the growth, lamb laden gyros are prolific through the likes of industry darling, Halal Guys, among others. Lamb continues to impress diners with provocative flavor while marginalizing what was once dismissed as gamey meat. Beef falls off protein leader chart as the lowest protein of interest from millennial diners with 51.3% reduced mentions of beef menu items in the past year. The 32oz porterhouse is moving more niche while protein-accented dishes are definitely ubiquitous. The Palm can still do it in the theater district. But that is a different demographic; and one that is on the slide. Steaks and subprimal cuts of beef are down to the fifth spot in the most loved protein ranking. Burgers are the exception. Newbie on a mission, Hunger Burger, titan Shake Shack, fan favorites In ‘n Out, BurgerFi, and Fat Burger exist because there is a demand that continues to swell. Burgers hold valuable real estate on casual menus, but burgers aren’t steaks. Strips and filets are high dollar investments, on both sides of the table while more interesting choices pervade menus. Why settle for ho-hum slices of flank steak on tacos when spicy mahi-mahi is an option? Or opt for lackluster beef cubes in a stir-fry when wild shrimp are at the same price point? For now, beef is out to pasture, while perceived healthier alternatives get the nod. Though millennial dining occasions have dropped 34.2% in general in the past year, dining occasions with healthy halo concepts have increased 11.5% in the same time period from the same demographic. Every morsel of restaurant research points to healthier options. Across every demographic, the nod to health consciousness is evident. The halo effect does not mean healthy, but a more fervent approach to nutritionally sound, specifically sourced ingredients that play into demands. The boomers want flavors, but want to keep balance. The Gen Xers want big flavors, multiethnic options and they, too, want to cling to a healthful salvation. Millennials? They are kale natives; green leafy vegetables, quinoa, and less sugary drinks are routine. It only follows that the center of the plate is subject to the same refinement. Know protein, not no protein. Plates replete with farro, carrots, figs, brown rice, sweet potatoes, sorghum, and chickpeas are not visionary—they are contemporary additions to menus and preferences. Breakouts like True Food Kitchen, HoneyGrow, and Sweet Green are making sure of that. Smaller protein portions, scattered throughout a noodle dish, stir-fried or disbursed through greens are typical. Even a more seasoned brand like SaladWorks is keeping pace as lettuce mixes, avocado, and cranberries are focal points of their dishes. There is no exclusion of animal-based proteins. Instead, meat is being dropped in as a flavor, as an addition, as a bump to the cause. Currently, there is no agreed definition of sustainability as it pertains to seafood by either the industry or environmental Non-Governmental Organizations (NGOs). This presents a tough challenge when looking into seafood regulation. Foodable: Can you elaborate on your sustainability practices? Minimal harm. Which means minimizing bycatch of non-targeted fish as well as minimizing harm of other marine plants, animals, ocean and freshwater environments. No overfishing. Overfishing happens when too many fish are taken from the sea and there are not enough fish left to replenish the natural population. Transparency and collaboration: All stakeholders with an interest in Alaska fisheries, including the fishing industry, environmental groups, scientists, academia and other interested organizations have an opportunity to participate in Alaska’s fisheries management process by way of the Alaska Department of Fish and Game Advisory Committee meetings, the Alaska Board of Fish meetings and the federal North Pacific Fishery Management Council meetings. *The above principles are aligned with United Nations Food and Agriculture Organization (FAO) Code of Conduct for Responsible Fisheries, the most comprehensive and respected fisheries management guidelines in the world. Foodable: How do you deliver seafood to your distribution partners? Ground, sea or air transportation? MK: Alaska seafood producers deliver high-quality Alaska seafood all over the world. Alaska seafood is delivered by ground, sea and air; however, the majority of transport is done by sea delivering frozen fresh seafood. Foodable: What is ASMI doing to minimize its CO2 footprint? MK: More than 80 percent of Alaska seafood is exported frozen to international markets. The majority of the frozen export is shipped via ship and rail/truck which promotes a more eco-friendly option to delivering seafood when compared to airfreight. Foodable: Can you give us background information behind genetically modified seafood? How is ASMI involved in this recent move? MK: GMO seafood production is market driven. The faster and more reliable a salmon can be produced, the easier it will be for suppliers to cater to certain markets. Wild Alaska seafood is sustainably managed and harvested independently from the production of GMO seafood. Alaska lawmakers have worked hard to require the FDA to mandate labeling of genetically engineered salmon to provide the consumer information on the origin of the seafood they are eating. Under the stipulations of the FDA's approval for GMO salmon, genetically engineered salmon eggs will be produced in Canada, and then shipped off to Panama to be raised in pens. This process provides no benefit to the American economy, let alone the Alaskan economy. Foodable: Why is proper labeling is so important in the effort to promote sustainable fish? MK: Currently, U.S. regulations often only require a fish to be labeled with its market name, which is designated by the FDA’s seafood list. Furthermore, retailers must provide Country of Origin or “COOL” labeling. However, none of these labels provides consumers with sustainability information about their seafood. In addition, illegal, unreported and unregulated fishing, as well as seafood fraud are challenges that the seafood industry faces [and it is addressing through the Seafood Import Monitoring Program which went into effect January 1]. Third-party certification programs and the use of eco-labels are one way to demonstrate fisheries’ adherence to environmental sustainability standards. All seafood in Alaska is sustainable and many fisheries hold dual certifications with both the Marine Stewardship Council (MSC) and the Alaska Responsible Fisheries Management (RFM) Program. Though it is important to note that certification (whether that be MSC or RFM) is not what makes Alaska fisheries sustainable. Rather, certification is primarily a market access tool, and a verification of responsible fisheries management. If certification programs were to be eliminated tomorrow, nothing would change with Alaska’s fisheries and we would still maintain our rigorous management practices that protect our resource and ensure sustainable seafood for generations to come. You can download the full Protein Sourcing Report and receive access to the complete data set, including protein rankings and exclusive interviews with top suppliers. These are all available in our all new Foodable Plus Membership where you have access to our latest reports, special podcasts and custom research and editorial.